I received an email with a list of all the restaurants participating in Restaurant Week and as we were going away, I decided to see which restaurants in Mossel Bay were participating. We chose Route 57 as both Dave and I liked the sound of the menu. At the time of making the booking I did not realize that there was a set menu for restaurant week, with a choice between 2 main courses and 2 desserts for R175 per person for the two course meal. In 2000, Louis Oosthuizen played his lowest round of golf at Mossel Bay Golf Club – a 57 gross (15 under par). He opened Route 57, named after this score, together with Ilze Nel and Anzelle Zeelie. Ilze was a bit abrupt when we arrived, but she is quite friendly in her own way and was very pleasant. Our name was not on the list of booked tables, but our booking had been processed on line and the reference number sent through. We were shown to our reserved table which was the only table in that room of the old house. The wine list is good and divided into estates, with a photograph of the winemaker on each page. 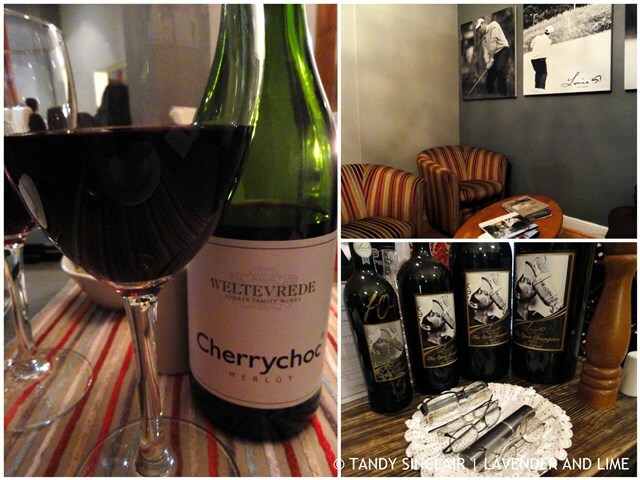 There are some serious wine estates represented and we chose the Weltevrede Cherry Choc Merlot (R110). The wine is light with cherry on the nose, and mild chocolate on the palate. While we were reading the menu we were brought farm bread to nibble on which I suspect is home made. The average cost for a main course is R118 and the menu is varied, including platters and burgers as well as traditional South African cuisine. The dessert list includes a cheese platter which is always a bonus for us as Dave does not have a sweet tooth. Dave started with viskoekies (R50) and the portion was generous. They were very tasty, with a hint of curry. The fishcakes were freshly made and hot, with a crispy exterior. 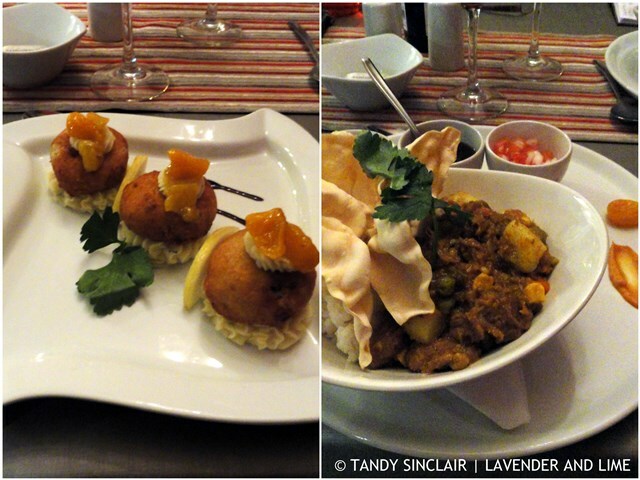 For his main course Dave chose the Cape Malay Curry (R110) which had a lovely flavour. The curry was beef which tends to be tough, but it was tender with a really decent punch of flavour. I had the South African Bredie as my main course. The lamb bredie was served with waterblommetjies. These edible pond weeds are in season right now, and made a change from the traditional tomato stew I would normally make. The meal needed a bit of salt, but it was tender and served with really good vegetables, all of which, other than the carrot, was cooked to perfection. I had the crème brûlée (R40) for dessert. I think the sugar was grilled and it was perfectly crisp. The custard was creamy and smooth but I thought it could do with a bit of a flavour burst. The staff are presentable and our waitress was polite and friendly. The lighting is great, which makes reading the menu a pleasure. The restaurant is nicely decorated and warm and there was a good choice of music, all instrumental, which is not obtrusive. The tables are dressed with decent linen, there are linen napkins and the cutlery and crockery are of a good quality. 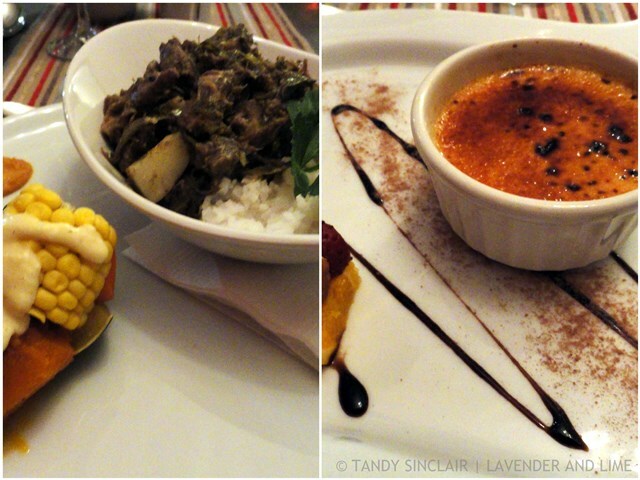 We did not like the choices on the restaurant week menu, and Ilze allowed us to eat from the a la carte menu. Excluding the wine, the meal came to R302. Had we eaten from the set menu we would have paid R350. Something is not quite right with the restaurant week concept if it is more expensive than the standard menu. Ilze had left the wine off the bill in error and was quite surprised when we pointed this out to her. This post was a real education Tandy. Converting the prices (quite a bargain! ), looking up where Mossel Bay is and learning about waterblommetjies. Isn’t amazing that our countries can be so close and so similar in terrain and climate and yet still so foreign? I liked the story behind why the resaurant is named Route 57. Thanks Uru and I hope that your exams are going OK! It’s interesting that across the oceans, we have restaurant week here as well. Ours was about a month ago and it was a wonderful opportunity to sample a few new places. Your food looks very upscale and delicious. We just hit up pub food, but it was really good too =) Looks like you had a wonderful time. Hi Tandy, sounds like another wonderful restaurant. My husband does not care too much for sweets, but there are a few things he will eat. looks delicious and love thir generous portion!!! Sounds like you had a fun restaurant week experience even though you didn’t participate in the actual menu! Nice that the restaurant was so flexible. Mmmmm – yes it can be a trap supporting some of these events – I know that the same sort of thing has happen to us!